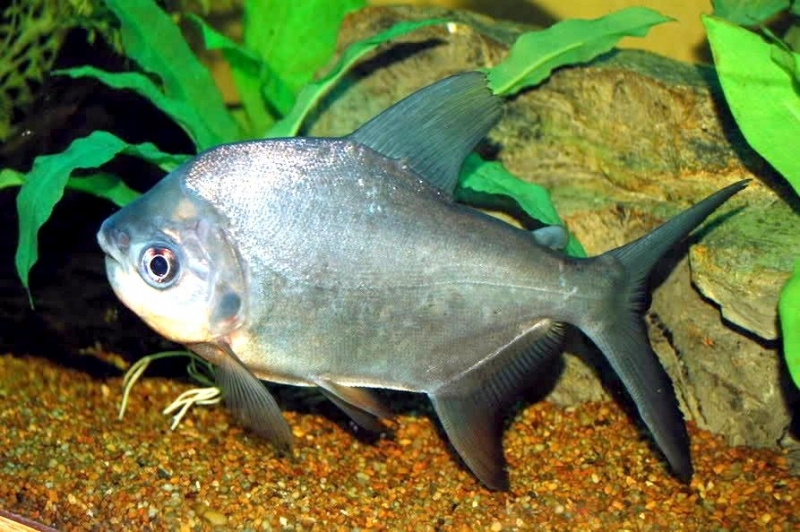 The Black Pacu also known as the “Tambaqui”, is a characin just like such favorites as the Neon Tetra and the Glolight Tetra. 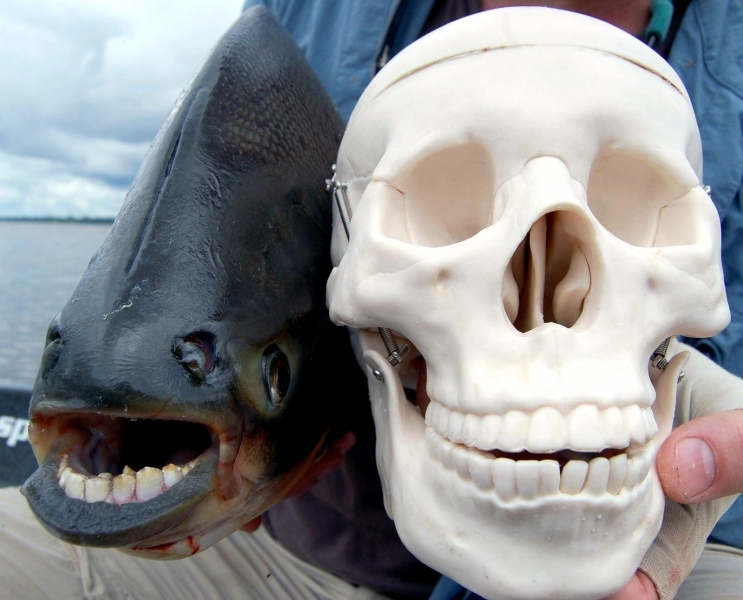 However that is where the similarities end. 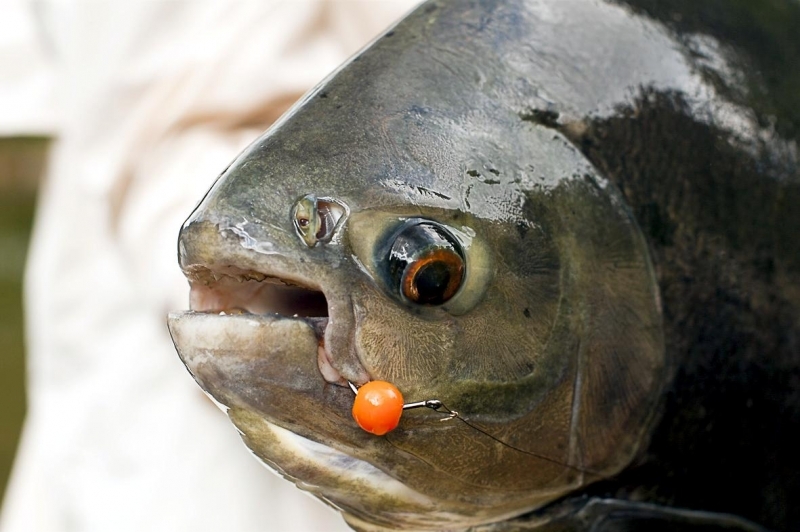 The name Pacu is a term of Brazilian Indian origin. 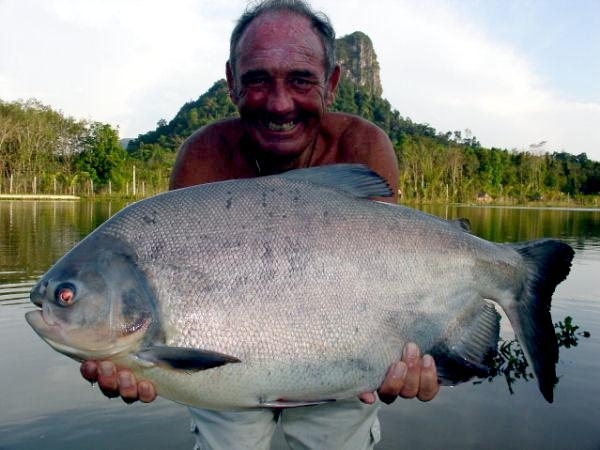 In the Amazon, the term pacu is generally reserved to naming a smaller and medium-sized fish. 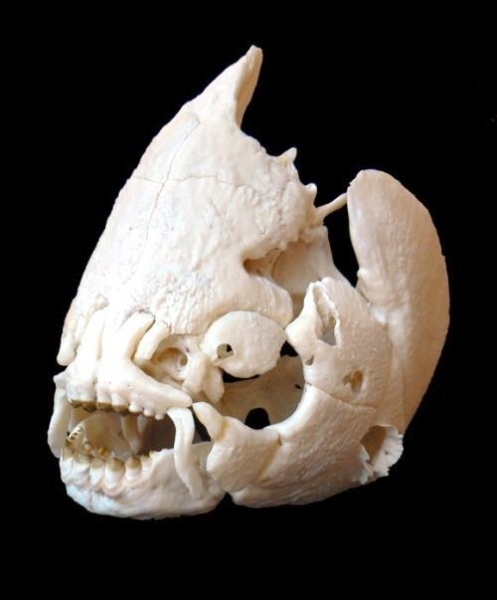 This fish is the largest characin found in South America and barely resembles most of its characin cousins. 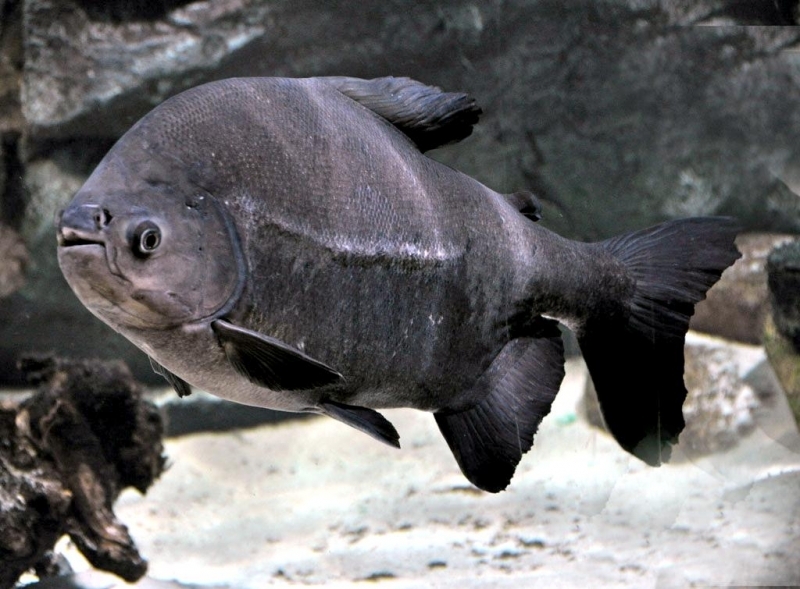 Reaching an average size of 3.5 feet (108 centimeters) in length and weighing over 60 pounds in the wild, the Black Pacu is an impressive fish. 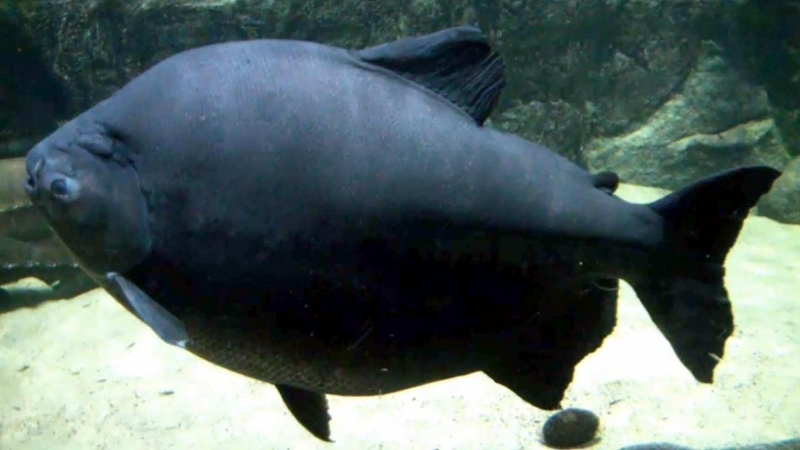 5.5 feet is their largest size, while a more common length for them to is up to about 27.5 inches (70 centimeters). 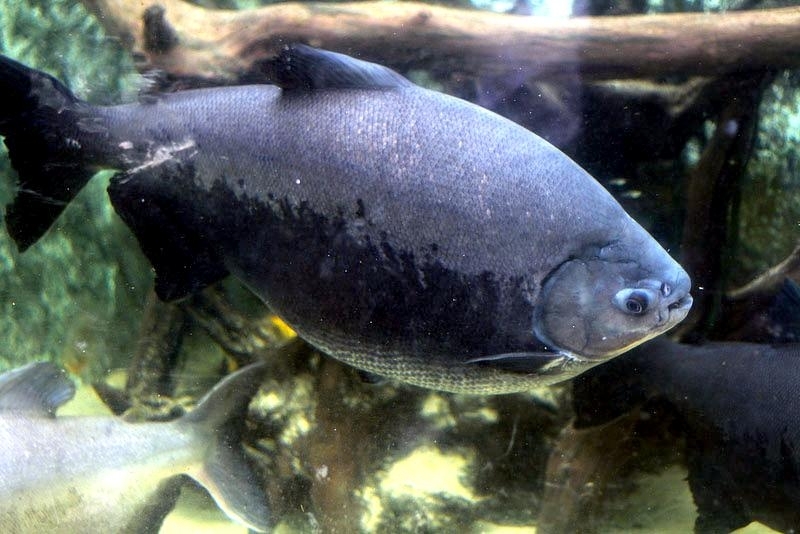 Other common names for the Black Pacu are Black-finned Pacu, Amazon Pacu and Giant Pacu. 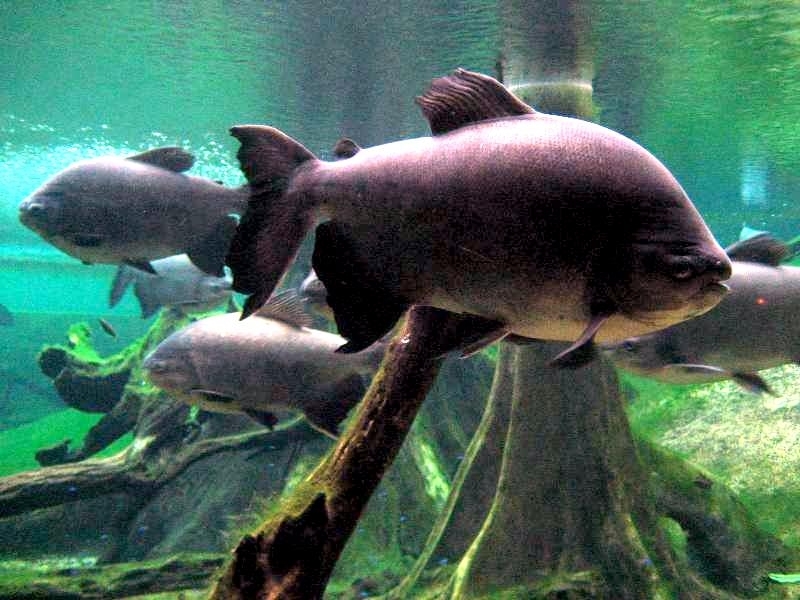 The Black Pacu is a South American freshwater fish found in most rivers and streams in the Amazon and Orinoco river basins of lowland Amazonia, but they have also been reported as far as Papua New Guinea, where it was artificially introduced to aid the local fishing industry. 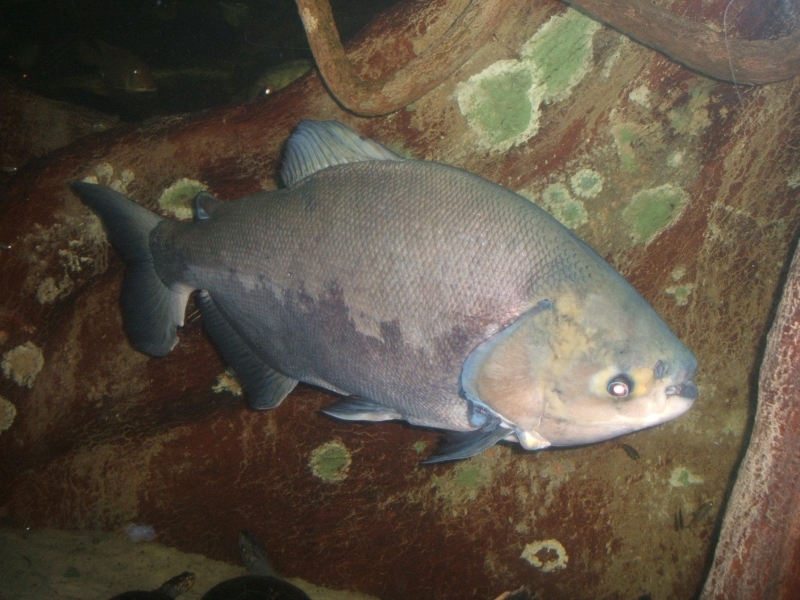 The Black Pacu is related to the meat-eating Red-bellied Piranha, both sharing the same subfamily Serrasalminae, although they have different food habits. 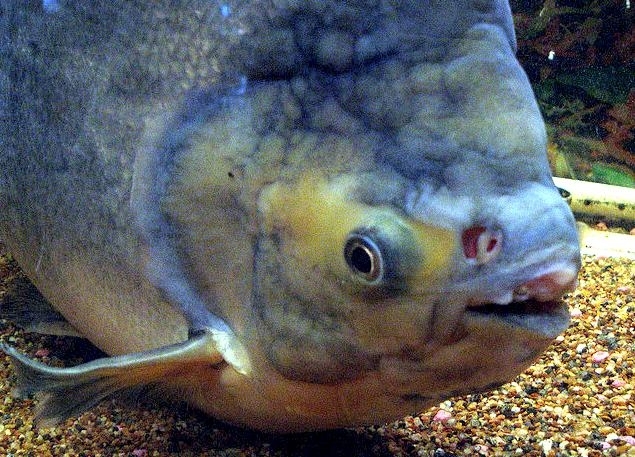 The piranha is a carnivorous species while the Black Pacu is omnivorous with vegetative tendencies. 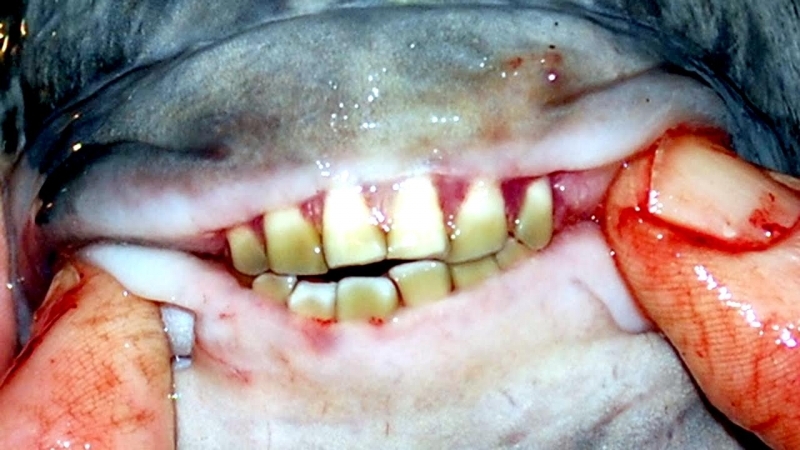 The difference is evident in the structure of their teeth. 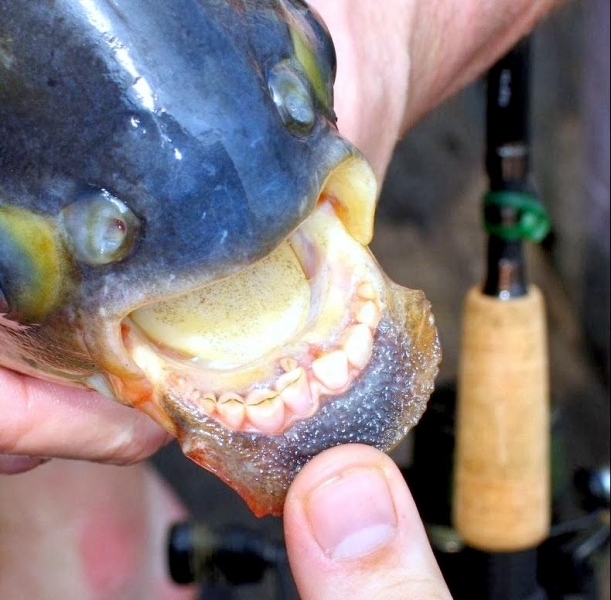 Red-bellied Piranha have pointed, razor-sharp teeth whereas Black Pacus have squarer, straighter teeth, that eerily resemble those of humans. 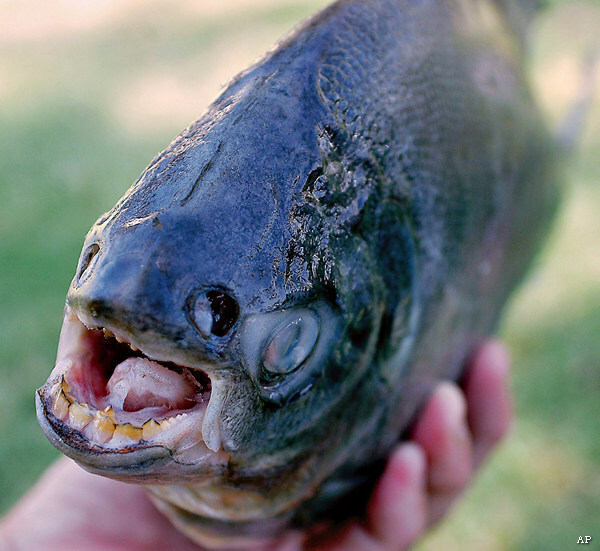 Black Pacus uses its teeth mainly to crush nuts and fruits, but sometimes they also eat other fish and invertebrates. 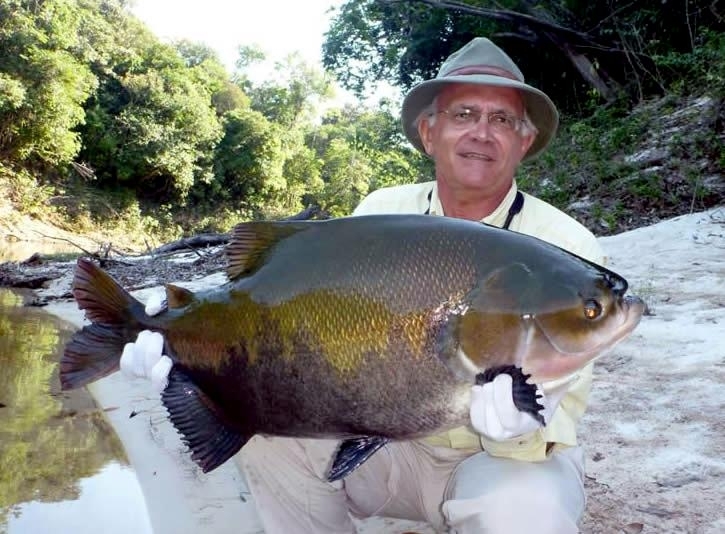 They usually eat floating fruits and nuts that drop from trees in the Amazon and on a few occasions were reported to attack the testicles of male swimmers mistaking them to be floating nuts. 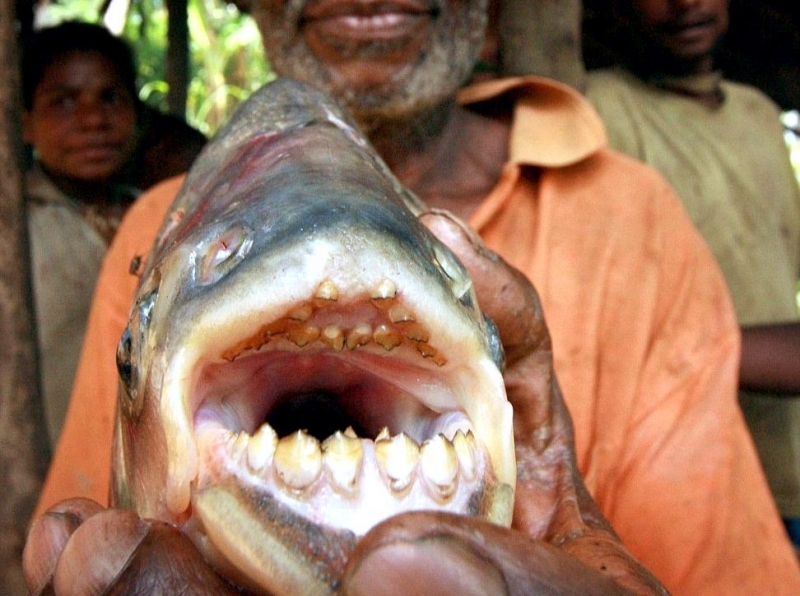 This has earned them the name of “ball-cutter” after they castrated a couple of local fishermen in Papua New Guinea. 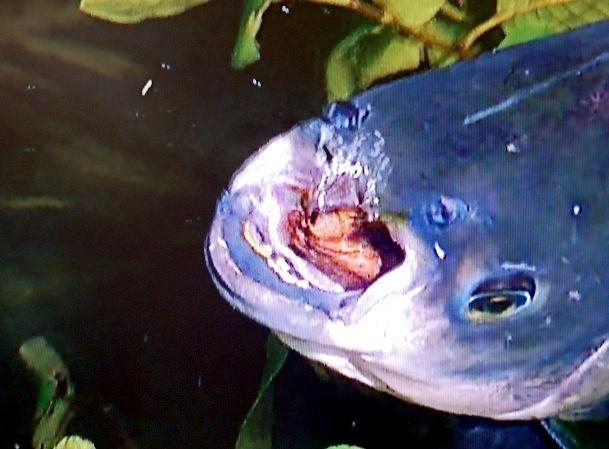 So when the fish was spotted in a few odd lakes in Denmark and later in Washington, New Jersey and Illinois last year, a mild panic ensued. 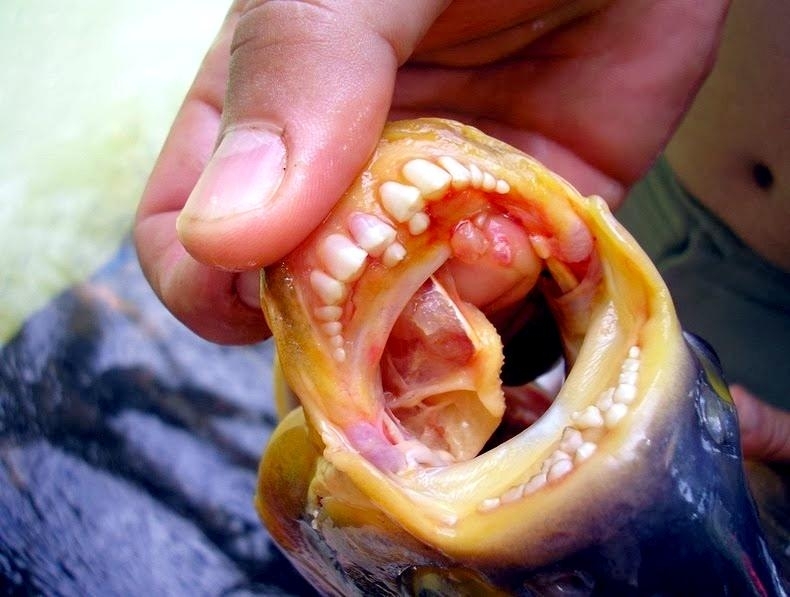 While they are not aggressive carnivores like the Red-bellied Piranha, their crushing jaw system can be hazardous. 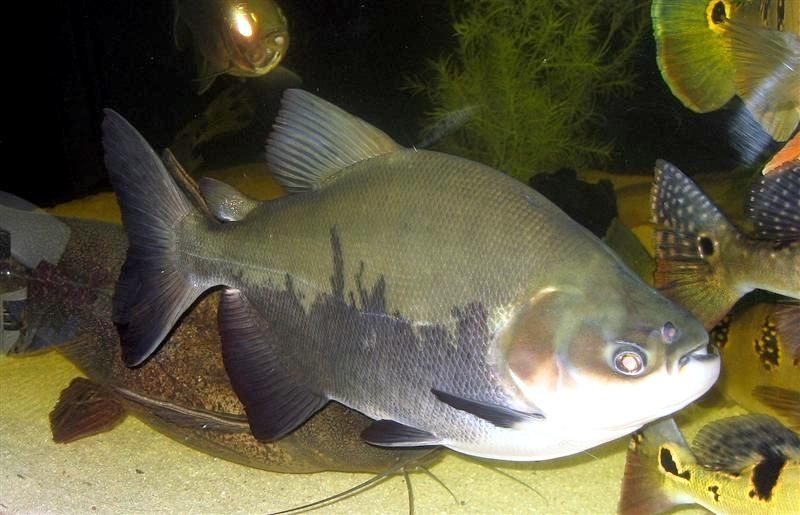 One toddler needed surgery after a Black Pacu bit her finger at Edinburgh Butterfly and Insect World in Scotland. 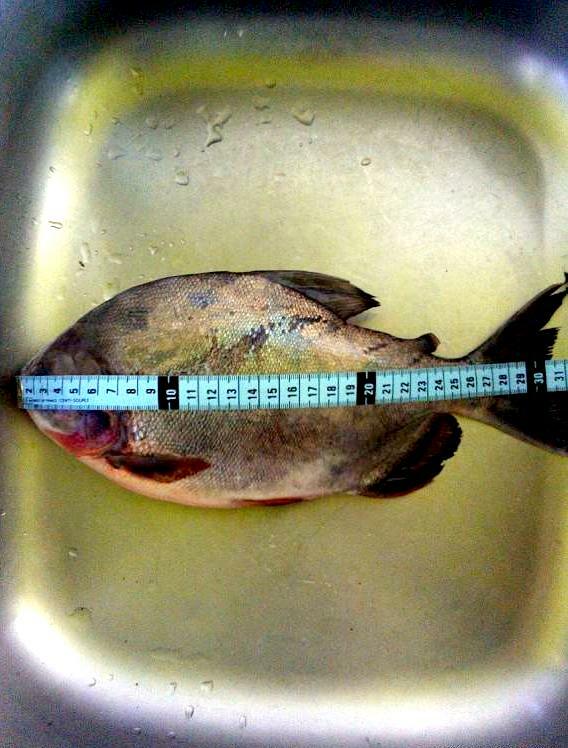 Commenting on the incident, Deep Sea World zoological manager Matthew Kane warned, “Black Pacus will eat anything, even children’s wiggling fingers”. 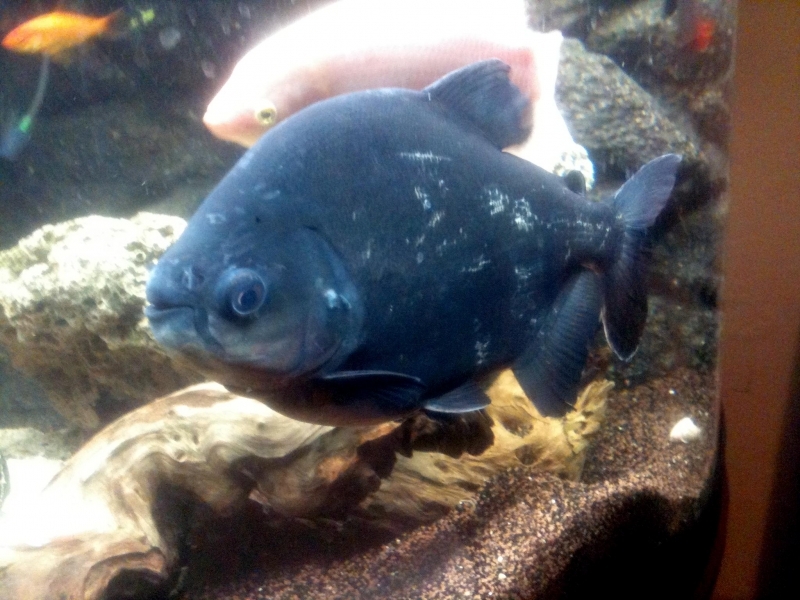 Black Pacus are legal to own in the United States, can be bought in aquarium stores and are easy to raise. 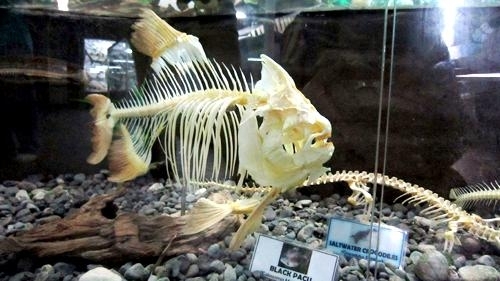 The trouble is, many aquarium owners are unaware that Black Pacus can grow up to 4 feet long, which is way too large for a typical home aquarium. 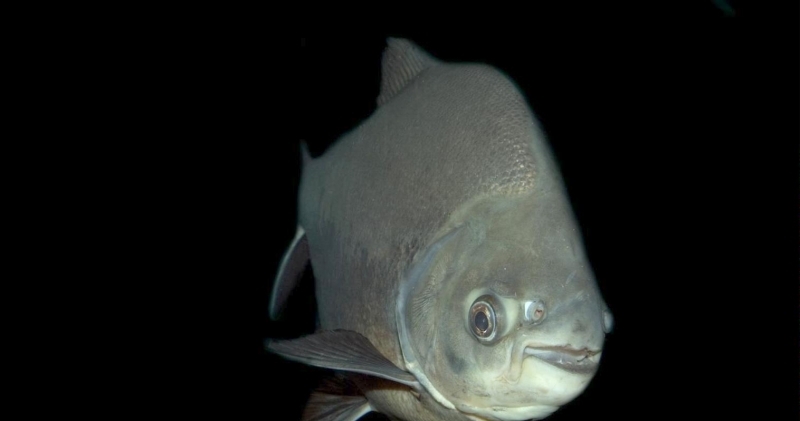 When a pet Black Pacu outgrow their fish tank, many owners end up dumping the fish in nearby lakes. 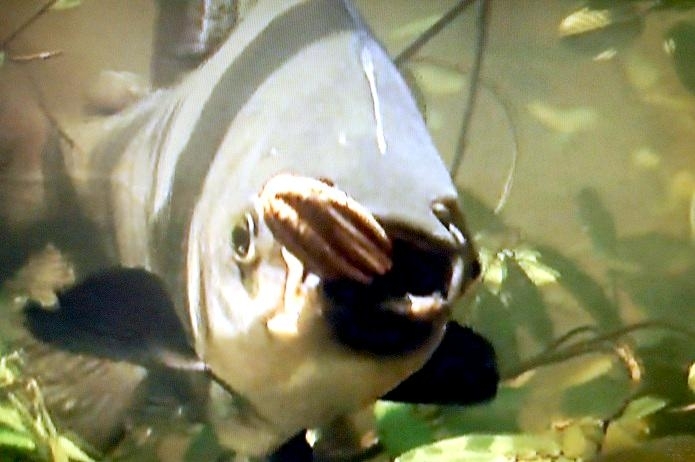 The Black Pacu is interesting, personable, very hardy and easy to feed. 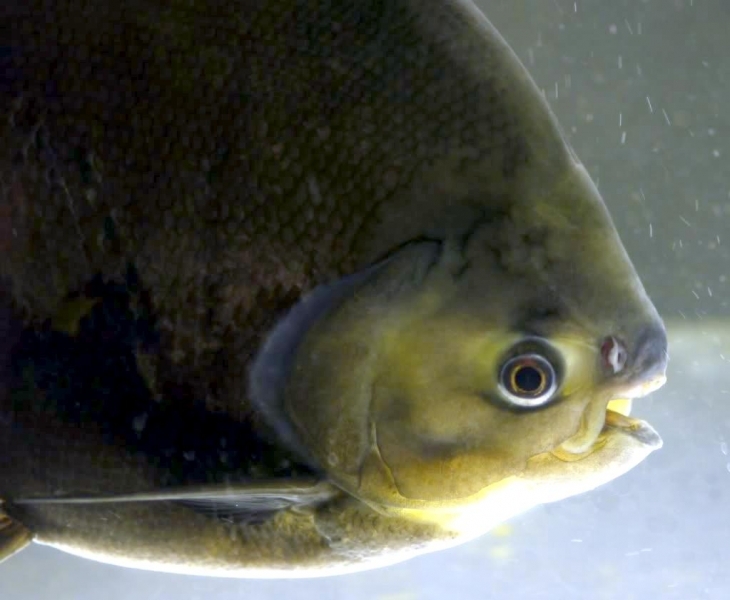 This makes it sound like the perfect aquarium fish. 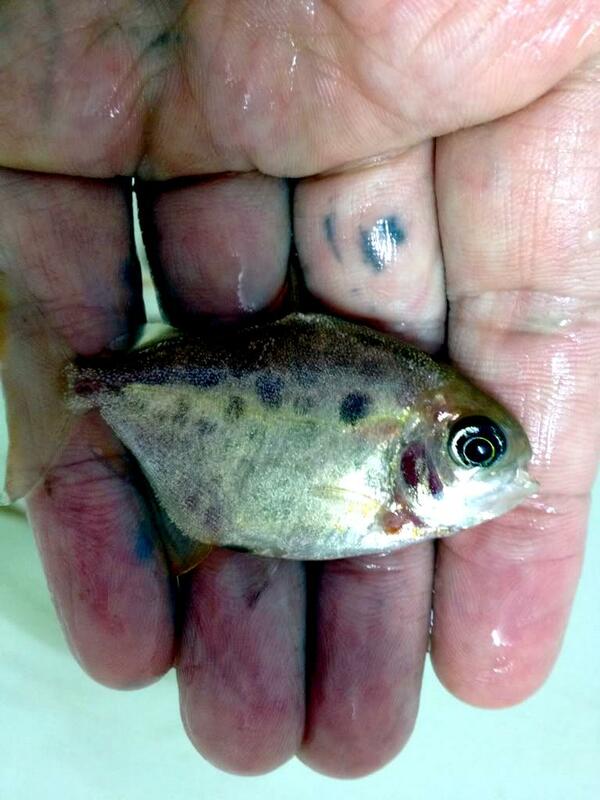 Unfortunately the one big problem in keeping these as a pet, is they grow fast and they get huge. 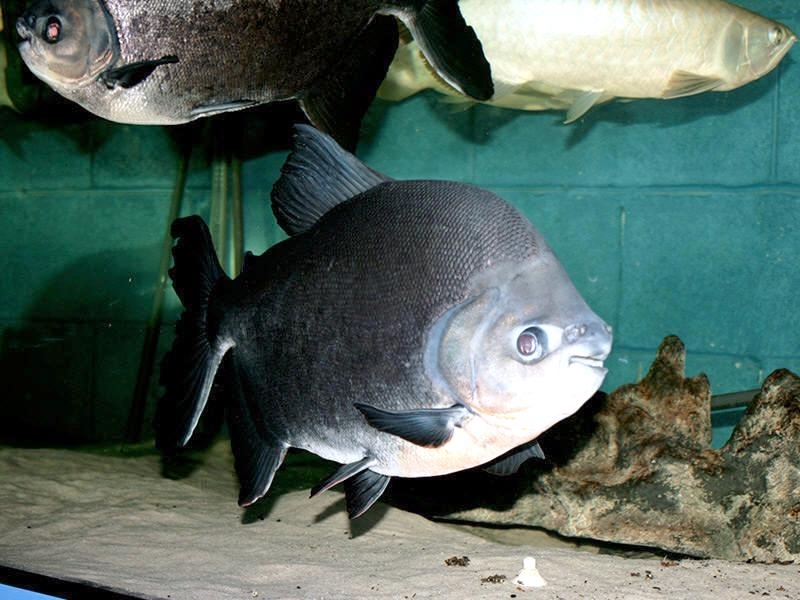 The Black Pacu soon outgrows all but the largest aquariums. 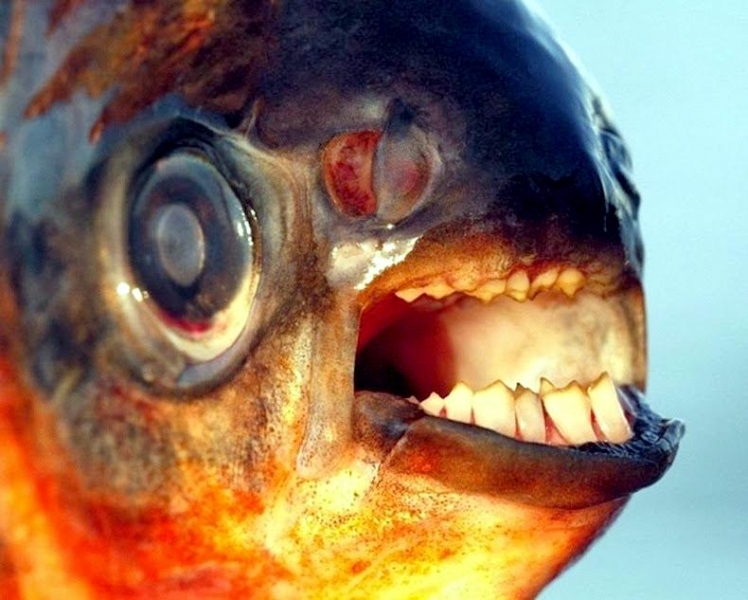 They are generally sold as juveniles and often mistaken for the similar looking Red-bellied Piranha. 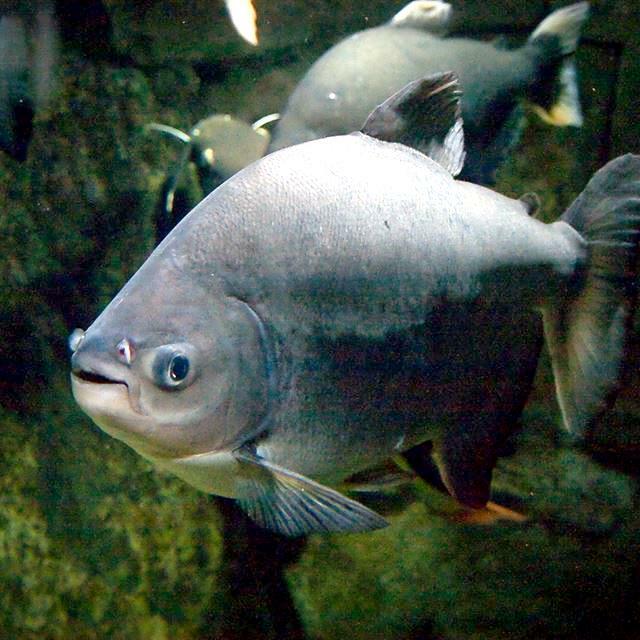 Although these two fish are close relatives, the Black Pacu is not an aggressive predator like the Red-bellied Piranha and generally has a more peaceful demeanor with tank mates. 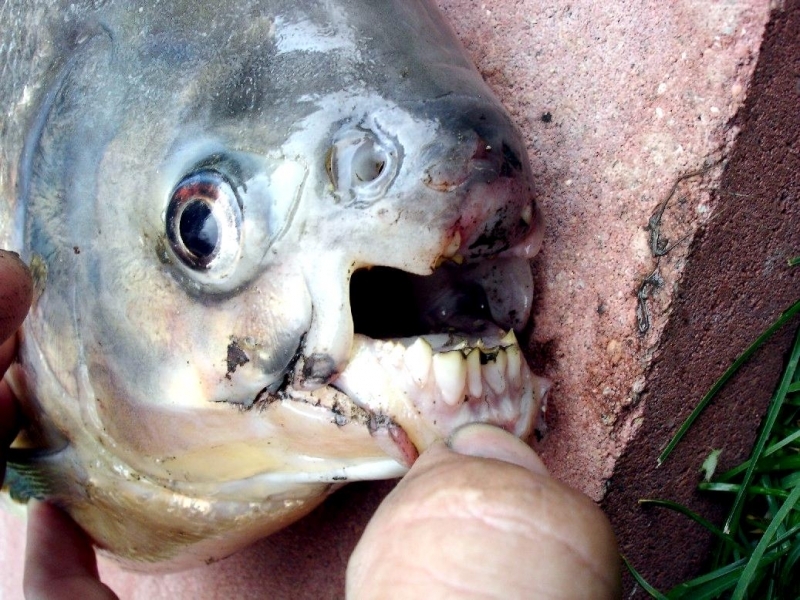 The young are a little more aggressive than adults. 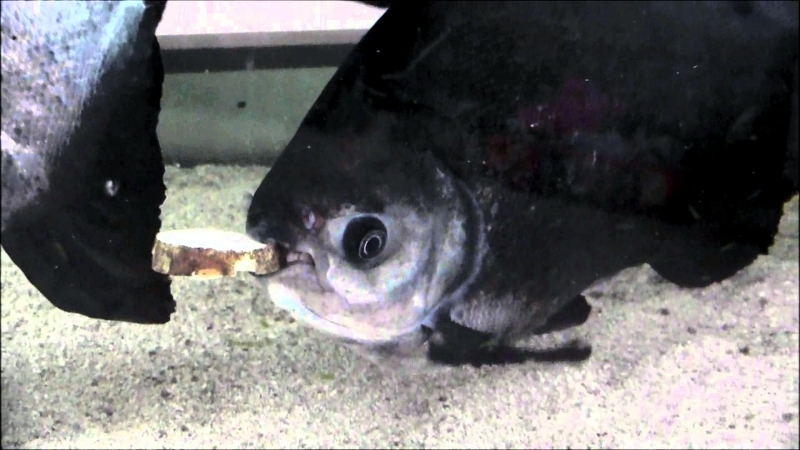 An adult even though peaceful, will eat anything small enough to fit in its mouth. 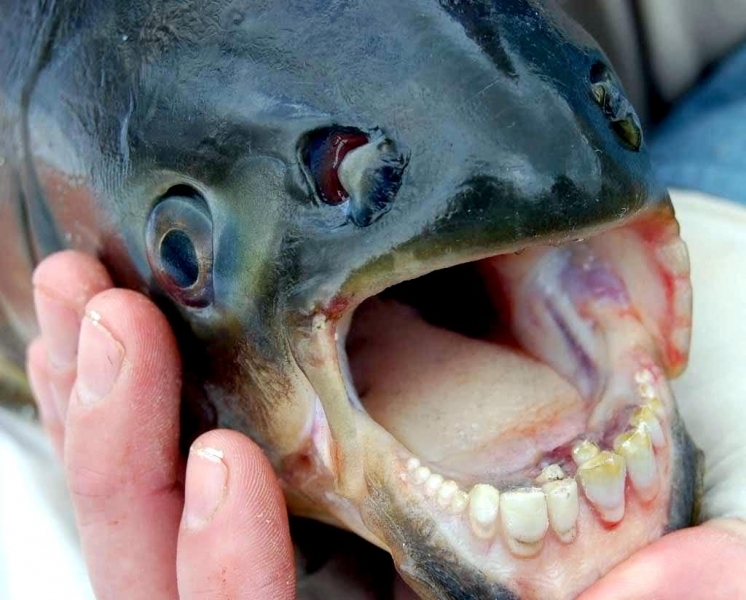 The Black Pacu is definitely a specialty fish. 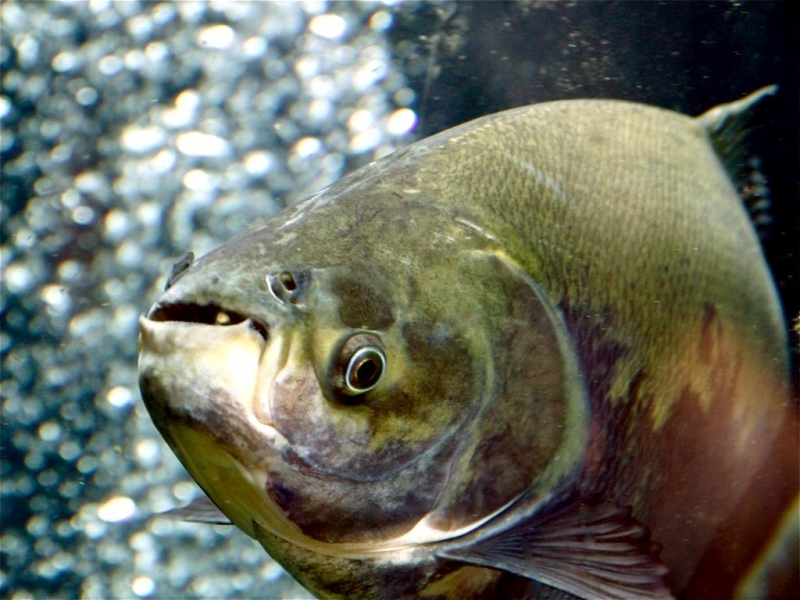 To keep one, you will need an aquarium of 850 gallons and upwards of a 1,300 gallons or more to house an adult. 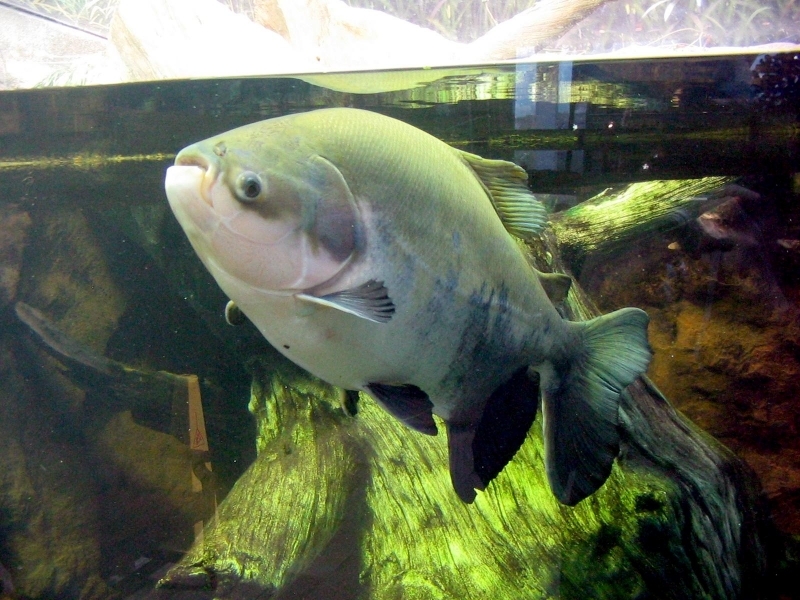 The tank should also have extra thick glass. 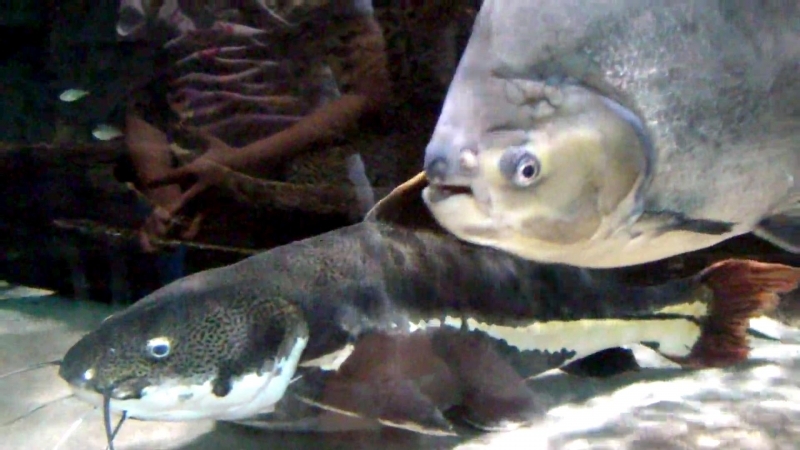 Black Pacus have been known to literally swim through the sides of an aquarium when spooked. 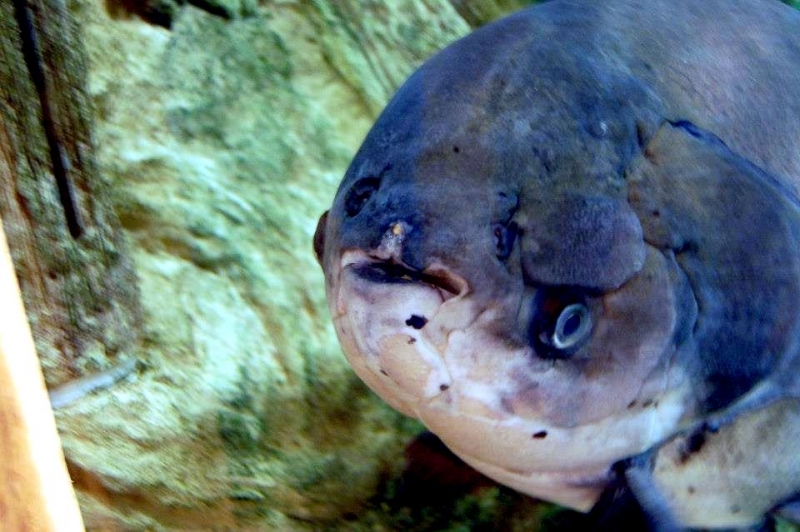 As their home must be so large, it limits the people who should keep one. 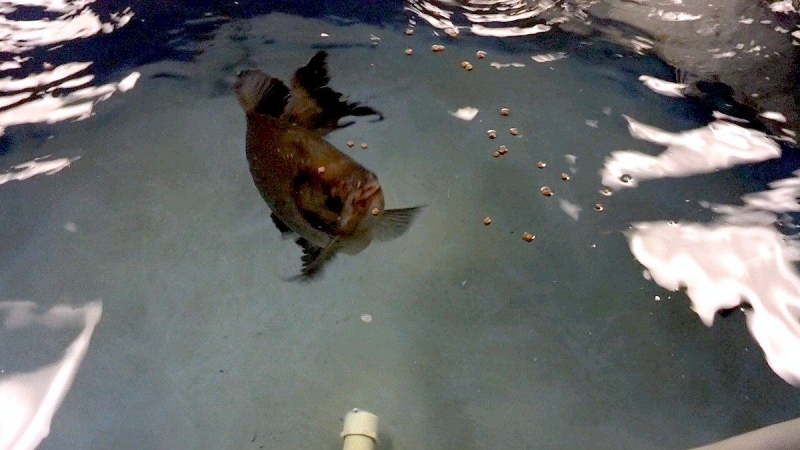 Some people have kept Black Pacus in heated indoor ponds but due to their dark color, they really can’t be appreciated when housed this way. 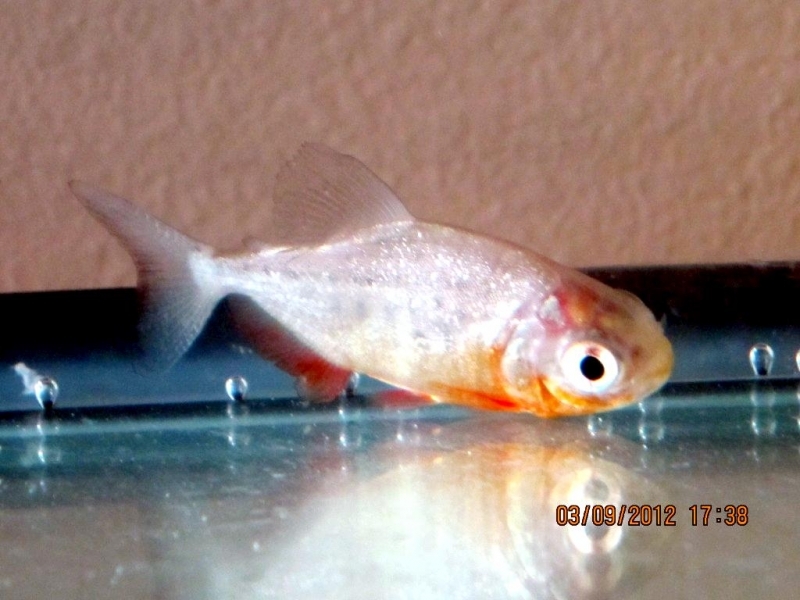 However if you have the space to provide for a huge tank, they are easy to keep.